Are you looking for a way to make your vehicle look amazing without having to go through the hassle of a brand new paint job? Do you want to help protect your paint without negatively impacting the way that your truck, car, or SUV looks? At Autobahn Collision Center in Torrance, we can apply a car wrap that does all that, and more! We like to think of ourselves as the one-stop body shop. Instead of focusing narrowly on one or two things, we have the skills, experience, and technicians needed to be able to offer you a wide range of auto body repair services. In addition to custom auto paint, we also offer car wraps. These wraps are fully customizable and easily removable, so you never have to worry about doing damage to your vehicle or being unable to adapt to new styles. 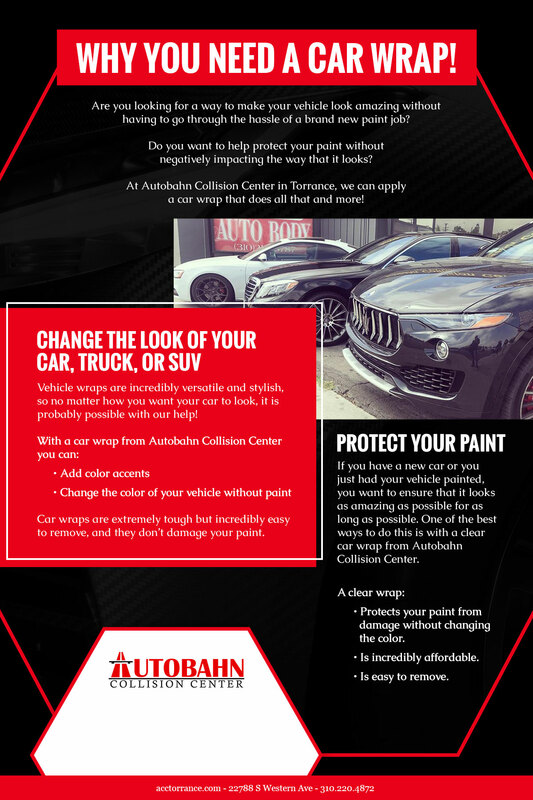 Read on to learn about some of the advantages of choosing Autobahn for all of your car wrap, collision repair, or vehicle restoration needs. Vehicle wraps are incredibly versatile and stylish, so no matter how you want your car to look, it is probably possible with our help! Car wraps are extremely tough but incredibly easy to remove, and they don’t damage your paint. Best of all, vehicle wraps are very affordable, which means that you won’t have to agonize over whether or not you want to jump in and change the color of your vehicle now or in the future! If you have a new car or you just had your vehicle painted, you want to ensure that it looks as amazing as possible for as long as possible. One of the best ways to do this is with a clear car wrap from Autobahn Collision Center. Protects your paint from damage without being obvious or changing the color. Unless you know exactly what you are looking for, it is almost impossible to tell that a vehicle has had a wrap installed. With a vehicle wrap, you get crystal-clear protection that still lets you show off! Is incredibly affordable. For a tiny fraction of the cost of paint, you can transform any vehicle into something new and amazing! Is easy to remove. Removing a wrap is quick and does not cause any damage to your vehicle. No matter how you want to turn your car into something special, Autobahn Collision Center in Torrance can help. Full restorations, a new coat of paint, a full body car wrap, we do it all. No one has the experience or skills that we do, and we know that once you choose us, you’ll stick with us. Contact us today for an estimate on a car wrap or any of the other services that we offer, or stop by either of our Torrance-area locations to speak to a member of our staff! ©2018 Autobahn Collision Center. Do Not Copy I All Rights Reserved.